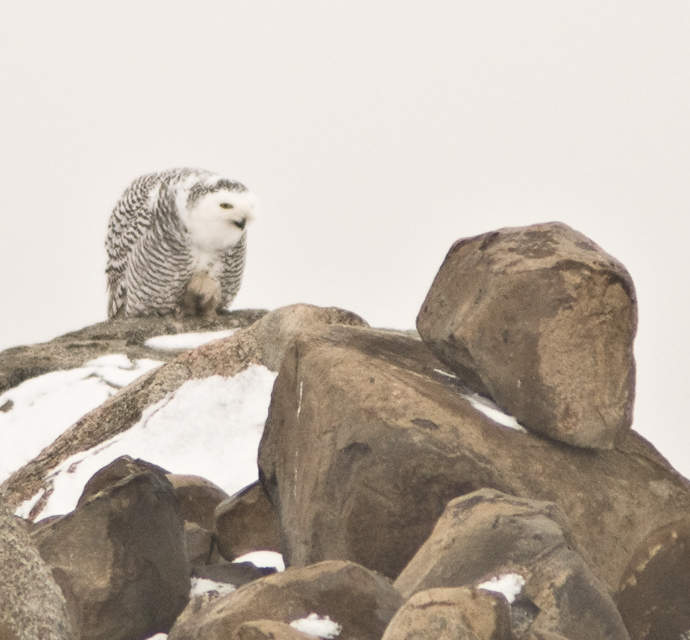 This year there has been a major irruption of Snowy Owls throughout the NW and other parts of the country. 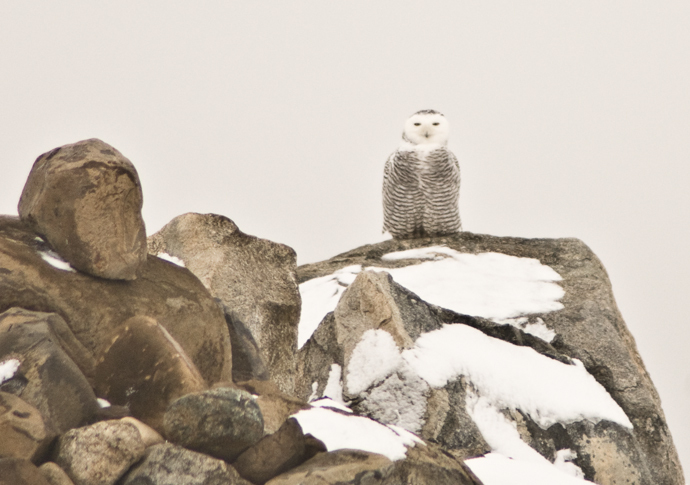 These bright white owls nest up in the far north and most years a few of them show up in Washington in the winter and occasionally lots of them migrate south. There are different theories as to why some years so many stray so far from their traditional wintering grounds – lack of food, overly bad weather, a succesful breeding season producing too many owls for the available food and so on and so forth. Whatever the reason, it is always a treat to get out in the field and see them. Four of us drove more than 100 miles through Okanogan and Douglas Counties searching for them and we were fortunate to find two just before the cloud cover lowered nearly to the ground. This was the closer one and really, it wasn’t very close for my meager camera equipment. 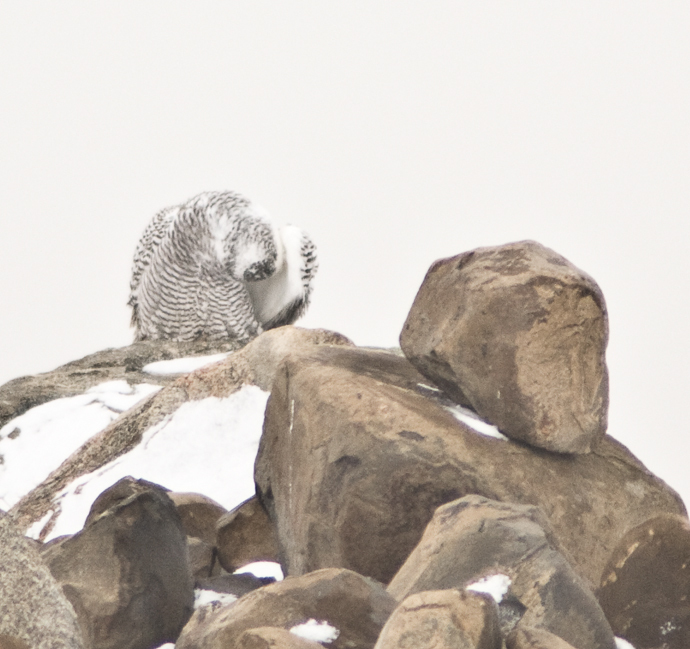 There are lots more Snowy Owl images out there of far better quality than mine. For me, it’s more about seeing the bird and being graced by its presence. 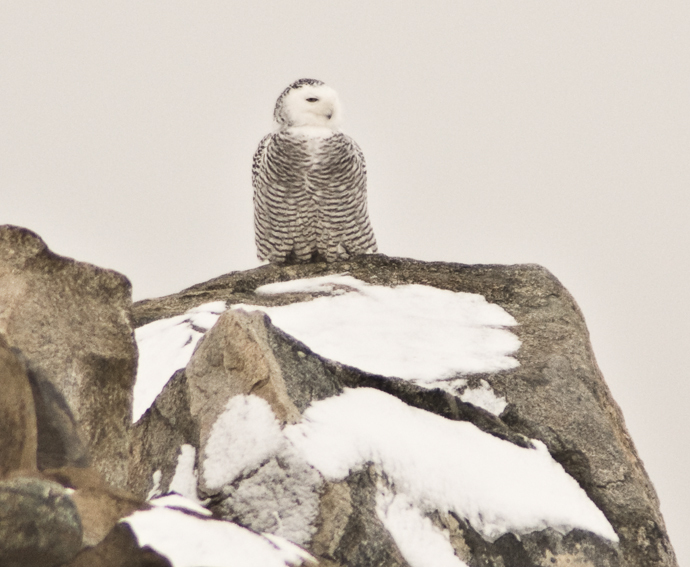 In addition to two Snowy Owls, we also saw a large flock of Snow Buntings, a Gyrfalcon, sevearl flocks of Horned Larks, numerous Rough-legged Hawks, a Merlin, quite a few American Kestrels and lots of waterfowl on the Columbia, Methow and Okanogan Rivers, including Trumpeter Swans and a pair of Eurasian Wigeons. It was a good day of birding. If you are interested in searching for Snowy Owls, here is a map showing reported sightings around the country. oh what I wouldn’t give to see one of these magnificent birds! Thanks for bringing it to me in these lovely photos.